Our favorite hood novela, Love & Hip Hop Atlanta, just keeps getting better and better. If you thought the drama would die down after season one ended, go ahead and uppercut yourself! 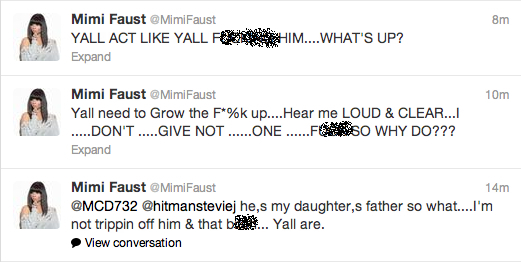 Moments after sending out the tweet, Mimi's followers proceeded to drag her to hell and beyond! The tweets went from "Mimi you can do better" to "You're wishing him a happy birthday and he's with Joseline right now". Well, Mimi wasn't having it tonight! She proceeded to go off in normal Mimi fashion. Mimi really tried it but as usual she came off looking like the bitter curse-filled tropical bird that she is. I love how she tries to act like she's above the b.s. and over Stevie but we already know what the deal is! Somewhere in Mimi's warped mind, she is still holding on to the idea of her, Stevie and their daughter Eva riding off into the sunset on Stevie's imaginary yellow bus. Stevie didn't leave Mimi hanging though, he replied to her tweet with "Thank you so much, Ma! Love always Oluermi". Oluermi is Mimi's real name, in case you didn't know! And in order to make the hood love triangle complete, Stevie's ride or die PuertoDominiTrini princess Joseline "Woman of God" Hernandez had to throw her two cents in but unfortunately for her, Stevie only retweeted her message. No reply or "I love you too" tweets for Joseline! Po' lil thing. 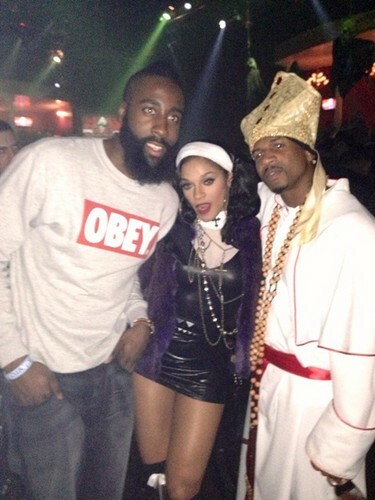 Hopefully Stevie's tweet to Mimi makes her feel a little better since he was just out partying with Joseline last night for Halloween. Stevie gives zero fawks about these broads. You gotta love him! What do you think of the Steebie, Joseline and Mimi ratchet love triangle? Mimi still lookin like booboo the fool.